Are you interested in becoming a physics teacher in the future? While you can always finish your physics degree first and then apply for BEd program, the Faculty of Science and the Faculty of Education are providing a different option for those who would like to start their teaching career earlier. The BSc/BEd dual degree programs provides an opportunity for you to confirm your interest in teaching before committing to a fifth year of study. Learn physics at the same time as learning how to teach it. You have the option of terminating BEd studies during the process, returning to a regular B.Sc program without loss of time. What are some benefits of the program? 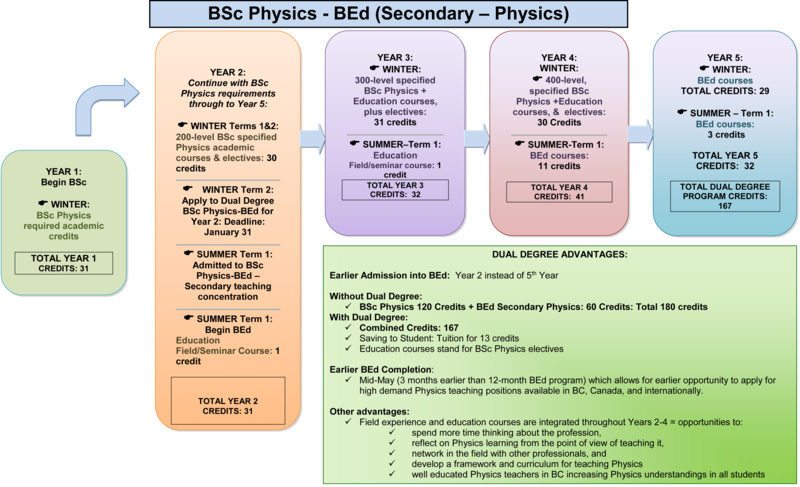 complete the requirements for two degrees, BSc Physics and BEd Secondary, over a period of 5 years - finish three months earlier than the traditional 4+1 post degree option. finish both degrees with less credit requirements than the traditional 4+1 post-degree option (there is some reduction in total credits required). This means reduced tuition costs for you! be eligible to apply for BC Provincial Teaching Certificate upon successful completion. be able to teach anywhere in the world. Apply during Term 2, Year 2. Both faculties must approve the application. A minimum 65% GPA in work to date is required – This GPA in academic studies must be maintained in order to remain active in the Dual Degree program. Some Summer Session study is required in Years 2-5 [Term 1 only]. Both faculties agree to accept as elective credits designated courses from the partner faculty. You must complete both degree programs to graduate from either, unless you terminate your BEd studies, in which case you can complete the normal BSc degree requirements. Bachelor of Education Viewbook: Check out p. 24 on this link, and for more information about teacher education at UBC. Information from the Teacher Education website: for information about the BEd dual degree and for links to contacting a BEd admissions advisor. 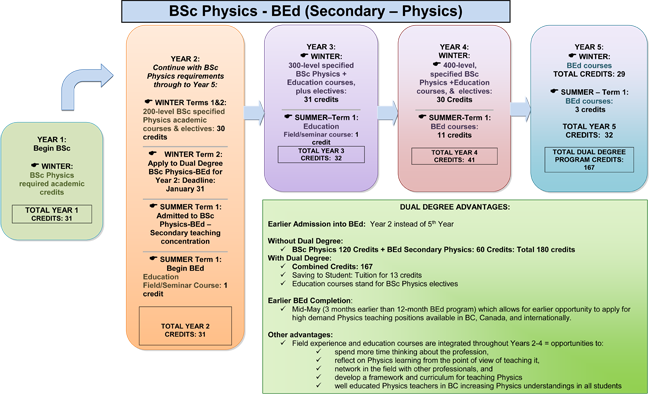 Download the BSc/BEd Dual Degree in Physics & Education application form. Completed applications should be submitted to Dr. Chris Waltham (UBC Dept of Physics & Astronomy). Contact Dr. Chris Waltham via email cew@phas.ubc.ca.